Free Newsletter on Cooking Tips, Kitchen Skills, Recipes and many more. 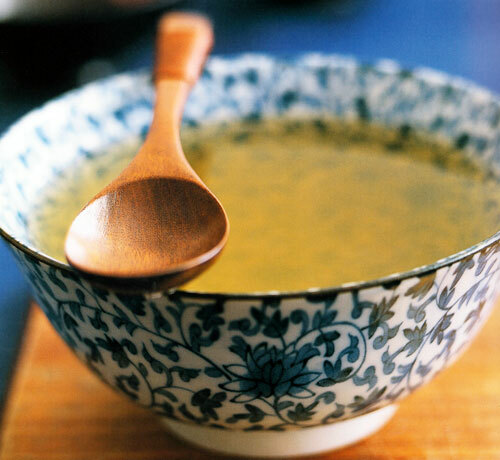 So essential is dashi broth to Japanese cookery that it is often rightfully called the soul of Japanese cuisine. Dashi forms the base of many Japanese soups, is used to simmer vegetables and dilutes and flavors dressings. Instant dashi granules can be a time-saving substitute. WIPE the konbu with a damp cloth but do not rub off the white powdery substance that will become obvious as it dries. Cut the konbu into strips. Place the konbu and 1.5 liters/52 fl oz/6 cups cold water into a saucepan and slowly bring to the boil, then remove the konbu. Quickly add 60 ml/2 fl oz/¼ cup cold water to stop the boiling process. Add bonito flakes, then allow it to return to the boil. Remove from the heat. Allow bonito flakes to sink to the bottom of the pan, then strain the liquid through a fine sieve. This stock is now ready for making clear soups. Wipe the konbu with a damp cloth but do not rub off the white powdery substance that will become obvious as it dries. Cut the konbu into strips. Place the konbu and 1.5 liters/52 fl oz/6 cups cold water into a saucepan and slowly bring to the boil. Quickly add 60 ml/2 fl oz/¼ cup cold water to stop the boiling process. Add the bonito flakes, then allow it to return to the boil and simmer for 15 minutes. Remove from the heat. Allow the bonito flakes to sink to the bottom of the pan then strain the liquid through a fine sieve. This stock is now ready for stews and thick soups. For konbu dashi I, cut the konbu into strips and place in a saucepan with 1.5 liters/52 fl oz/6 cups cold water. Bring to the boil, then remove konbu. For konbu dashi II, leave the konbu in the pot, reduce to a simmer and cook 10 minutes longer. © 2017 www.asianonlinerecipe.com - All Rights Reserved. All trademarks are the property of their respective owners.